*The ribbon color and embellishments may vary from the photo shown. The elastic stays put and keeps your hair 100% dry. The longevity will blow your diva mind! 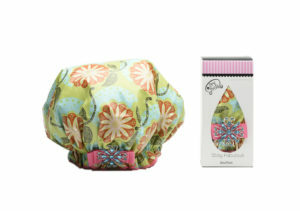 Our shower caps last up to 2-3 years. Machine washable – delicate cycle, inside out, cold. Air dry.